The last thing I expected Sunday morning was snow for our time trial but that is what Mother Nature had in mind for us (granted the snow wasn't significant and was more like a heavy flurry); we were all surprised by the weather and were not excited about riding (or at least I wasn't). Andy setting up the tripod. The team after arriving and unloading vans. Silly camera phone couldn't get the snow falling, but that's what this photo was supposed to be of. I arrived well rested after an evening spent at home in my own bed and well fed with an excellent meal at my favorite restaurant Sweetwater Tavern. 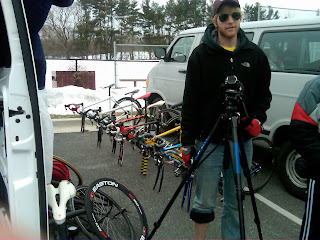 The site of the race was Davidsonville, MD - a.k.a The-Middle-of-Nowhere. 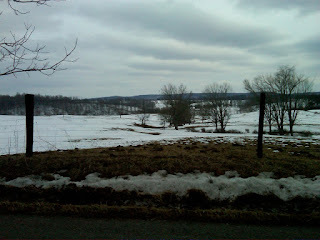 The surrounding area of Davidsonville was comprised mainly of farms and small back roads, which was good since the race course was open to traffic and made for minimal interference during the race. This was only my second TT but in reality was my first true test as last weeks "TT" if you want to call it that was really a prologue when comparing 2.5-ish miles to 17 (later found it the total distance was only 14 and change). I arrived about an hour before my race started so it was right to business getting myself dressed and on a trainer for a proper warm-up, which I'm still trying to figure out. After gathering all of my gear I got on the trainer for about 15 minutes and "warmed-up." Immediately after I rolled over to the start where I was a few minutes early, just enough time to make sure everything was set with my Garmin 310XT for recording the ride and that my PowerTap head unit was actually on unlike the previous day. I was first in my category AGAIN as I don't have a time to place me later in que since it goes slowest to fastest, which may not seem bad but I think I would do better if I had people to chase. I began the race with the goal to maintain or average my believed LT, 200 Watts. When I reached the halfway point in my race, around 22-minutes, I felt pretty good and decided I could go harder on the way back. On my way back I caught the last of the Men's D riders and quickly left him behind me. One of the really cool things about an out and back course is that you get to see everyone else in your race which was great having teammates encouragement in those last few miles. As I came around the last corner I gave it everything I had and pushed hard all the way through the line, I know there has to be a few goofy photos of me online somewhere coming through the finish with a look of pain on my face (not deserving so with my time). I put in a quick cool down and cleaned up in record time so I could spend some extra time with my dad at lucnh. I was very happy with my performance and felt that I came out of the race accomplishing my goals: 1. Don't blow up 2. Average 200 Watts. View my Garmin Connect Details for the TT. 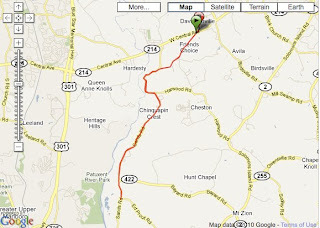 The course as recorded by the Garmin 310XT, not nearly as straight as the course map made us believe. Power Data from my TT, AVG 216 Watts. After finding out my official time compared the rest of my field I was disappointed with how I finished because even though I accomplished my goals, in the end I didn't perform very well. 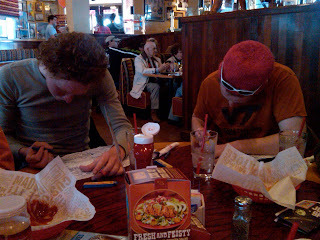 After the rest of the races had finished we loaded up the bikes in the cargo van and headed back south towards Blacksburg, exhausted from a weekend of racing....but not before we made a stop at Red Robin. Don't be stingy on the free fries because we're going to make you more busy sending you back for more, so just bring full baskets.... and lots of them. We were all pretty hungry, even me for my second lunch. 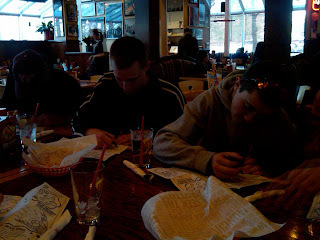 While we were waiting for our orders the team had a blast with the children's menu and even made competitions of who could finish the word-find and word scrambles the fastest. Justin M. and Reid racing for glory. You'd think it's an engineering exam (which all of these guys are) with how intently they were working on it. The weekend ended with a long drive home most of which I slept through, sorry Reid. After I got off work at 2 on Monday I decided to go for a SAYG ride to ease in the recovery process from a hard weekend of racing and get my legs ready for another week of training. 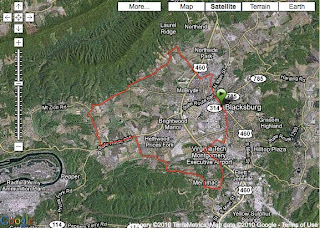 One of the problems with Blacksburg is that there isn't much flat other than the town, so even if you want an easy recovery ride it's difficult to find/achieve. I went out for a SAYG'esque ride trying to keep my power below about 118 (I wound up averaging 133 for the ride, so not too high far over). Power from the SAYG ride. The route. You can see everywhere you go outside of town there's mountains. 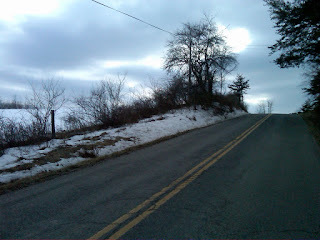 A photo of the road, particularly the incline. 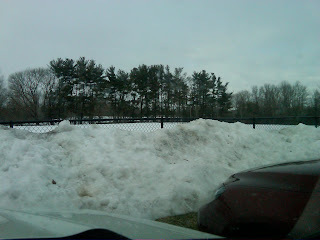 Still lots of snow in Blacksburg and the surrounding areas. 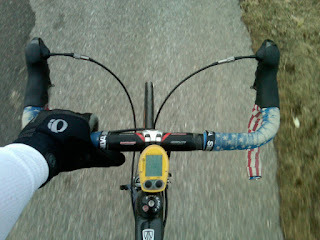 The last photo of the bike with Captain America tape. The rest of the week has been good so far with Tuesday as an off day and lots of activity today. More on today's workout to come and a preview of William & Mary race weekend. 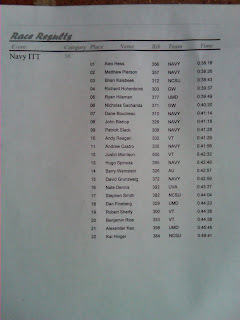 Posted by Unknown at 6:03 PM I'm reading from MyDailyGround: Navy Time Trial Recap + Monday's ride Tweet this!